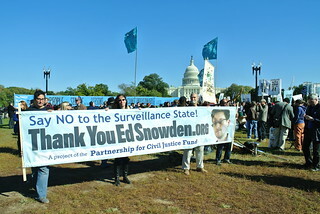 Former NSA contractor and whistleblower Edward Snowden had a statement read at the “Stop Watching Us” Rally against mass surveillance in Washington,DC. It was read by Justice Department whistleblower and attorney with the Government Accountability Project, Jesselyn Radack. The full statement appears below. In the last four months, we’ve learned a lot about our government. We’ve learned that the US Intelligence Community secretly built a system of pervasive surveillance. Today, no telephone in America makes a call without leaving a record with the NSA. Today, no Internet transaction enters or leaves America without passing through the NSA’s hands. Our representatives in Congress tell us this is not surveillance. They’re wrong. We’ve also learned this isn’t about red or blue party lines. Neither is it about terrorism. It is about power, control, and trust in government; about whether you have a voice in our democracy or decisions are made for you rather than with you. We’re here to remind our government officials that they are public servants, not private investigators. This is about the unconstitutional, unethical, and immoral actions of the modern-day surveillance state and how we all must work together to remind government to stop them. It’s about our right to know, to associate freely, and to live in an open society. We are witnessing an American moment in which ordinary people from high schools to high office stand up to oppose a dangerous trend in government. We are told that what is unconstitutional is not illegal, but we will not be fooled. We have not forgotten that the Fourth Amendment in our Bill of Rights prohibits government not only from searching our personal effects without a warrant but from seizing them in the first place. Holding to this principle, we declare that mass surveillance has no place in this country. It is time for reform. Elections are coming and we’re watching you.